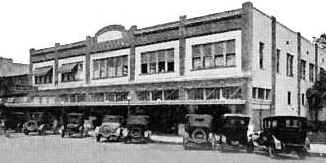 Original Location: Meisch Building, 1st Street and Seminole Blvd. WSFR-1959-Top 40 "Sanford Florida Radio"
Mr. Doug Douglass was kind enough to supply information for these pages. In a copy of pages for Sanford from the 1958 Broadcast Annual I found a listing for station WIOD in Sanford. I thought this was a misprint. Bill Reck co-owner of WTRR-AM 1400 in Sanford verified that there was in fact a second radio station would take to the air in Sanford in 1956. *On August 11, 1956 Miami station WIOD was acquired by the Biscayne Television (on the air originally in 1926) and the call letters became WCKR. In 1956 when Sanford Broadcasting Company began operation on 1360 the WIOD calls were available. On April 1, 1963, WCKR was acquired by Miami Valley Broadcasting Corp. and the WIOD calls returned after the Sanford station went silent in 1962. IN SANFORD. Mr. and Mrs. Emerson Browne and John Bolling filed an application for a new radio station in Sanford. Browne was former chief engineer of WTRR-AM 1400 in Sanford, but left to start his own station. The new station would broadcast daytimes at 1,000 watts. Washington UPI The Federal Communications Commission yesterday approved this corporate change for radio station WIOD, Sanford. Assignment of license to Sanford-Seminole Broadcasting Co., for $56,000. The purchasing company is headed by Joseph R. Horenstein, a stock, holder in WBAB-AM-FM, Babylon, N.Y.
Joseph R. Horenstein-1959-President-Sanford-Seminole Broadcasting, Inc. Bud Carrigan-1959-Commercial Manager-Sanford-Seminole Broadcasting, Inc. Note: 1926- WIOD 610 AM (Miami) is Florida’s seventh oldest continuously licensed broadcast radio station. Installed in the spring of 1925 by Carl Graham Fisher, a Miami Beach developer, the station made its formal air debut on the South Florida airwaves on January 19, 1926. Carl Fisher selected the letters WIOD as the call letters signifying “Wonderful Isles of Dreams” to commemorate Collins Island, on which the station was situated. After enduring several hurricanes and subsequent power shutdowns, WIOD was acquired by Isle of Dreams Broadcasting, a subsidiary of NBC, in early 1929. The station also shared time with sister station WOMB during this adverse period, and was known as WIOD-WOMB, using the on-air slogan “Wonderful Isle of Dreams.” James M. Cox, Jr. became the chief owner of Isle of Dreams Broadcasting Corporation in 1946, and the call letters became WCKR for owners Cox-Knight Radio. The company would eventually become Cox Broadcasting Corporation in early 1964.